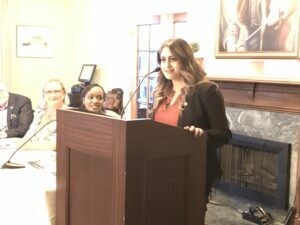 Chairs were at a premium at the Rideau Club last month, when Elevate International and The Foundation (WCPD) once again teamed up to support gender equality and philanthropic endeavours that are important to women. 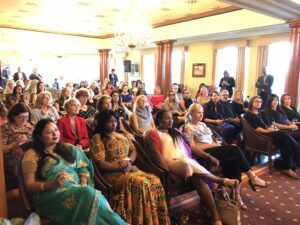 On September 18, The Foundation (WCPD) sponsored the second edition of Entre-Nous, a women’s networking series that has grown to include a large and diverse group of professionals all committed to gender equality in Canada and around the world. Leaders of finance, accounting, non-profits and many other industries streamed into the Rideau Club on a Tuesday night, forcing staff to continuously add chairs so attendees could sit and listen to the evening’s dynamic speakers. 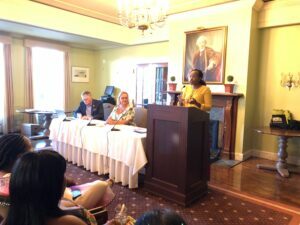 The panel included Katja Iversen, President and CEO of Women Deliver, a leading global advocate for gender equality and the health, rights and wellbeing of women and girls. Iversen, who was also in the city for meetings with public officials, was recently named one of the top 100 influencers in gender policy worldwide. She actually fell within the top 20, alongside leaders such as Justin Trudeau, the Prime Minister of Canada, Melinda Gates, Co-Founder of the Bill & Melinda Gates Foundation and Phumzile Mlambo-Ngcuka, Executive Director of UN Women. Also featured on the panel was Ken Fredeen, General Counsel for Deloitte LLP. Known as a champion of gender equality in a major Canadian corporation, he is often considered one of Canada’s most influential lawyers and judges. Solange Tuyishime, President and Founder of Elevate International, served as moderator for the panel and also delivered remarks. Kamal Khera, Parliamentary Secretary to the Minister of International Development, delivered closing remarks. With two successful events under its belt, The Foundation (WCPD) and Elevate International and looking to do more Entre-Nous events in Ottawa and beyond.